My dad in his younger days. Always missed and forever in my heart. “That’s my father.” … Seemingly an innocent and offhand remark made by the youngest of his three children, those three little words meant much more to our dad. I know it made him feel proud and happy to be that father, that figure of authority and loving protector of his family. I’m thinking of relatives and friends who lost their fathers very recently. My heart goes out to them today. These days, few of us experience the old-fashioned pleasure of receiving a letter by standard mail. So imagine my joy to find, tucked inside a Christmas card from my aunt in the U.S., a handwritten note, along with a handful of photos sent to her from my father. Discussing this with my aunt recently, she was unable to nail down the year they were taken, but she believes Dad made the trip to Labrador in the mid to late fifties. That would make him, at the youngest, twenty-one, and still single. I have captioned each one with his words. I love his outfit. Lots of layers, warm boots, yet he is wearing a jacket, shirt and tie, and his hair is perfect. This begs more questions: why did he fly out of Gander and not St. John’s? Who was he with and who took the pictures? Why did he make this trip to Labrador? Unfortunately, we are fuzzy on all the details. Deserted shack and our dog-sled at Big Bay between Hopedale and Davis Inlet. At Makkovik with “husky” pups. No surprise to me at all that Dad would love the little animals! Have you ever gotten mail that made your day? Is there someone you love and miss with all your heart? I’m too tired from novel writing to come up with anything of my own this week, so I’m sharing a post from Journey Into Poetry. Christine is one of my favorite bloggers for the poems she writes. a privilege for the dying. you had the patience of Job. I still haven’t a clue. In a recent telephone conversation with my aunt in the U.S., we got to talking about my dad (her brother), in his early years. Long before he fell in love with and married my mother, my father was an interesting fellow in his own right, excelling in his school studies and discovering his deep passion for all things musical. Most likely because of the popularity of the big bands and swing music back in the day, his first musical instrument of choice was the saxophone. Later, when icons like Johnny Cash, Chet Atkins, and Glen Campbell, to name a few, came on the scene, Dad took up the guitar. When Beatlemania exploded, he joyously took part by buying their albums and learning to play many of their songs. As many can attest, he stayed devoted to guitar music the rest of his life. As you can see from the above photo, my father was very thin when he was young. But after he married Mom, he began the quest of bodybuilding, transforming himself into the strong, well-muscled dad his children grew up with. 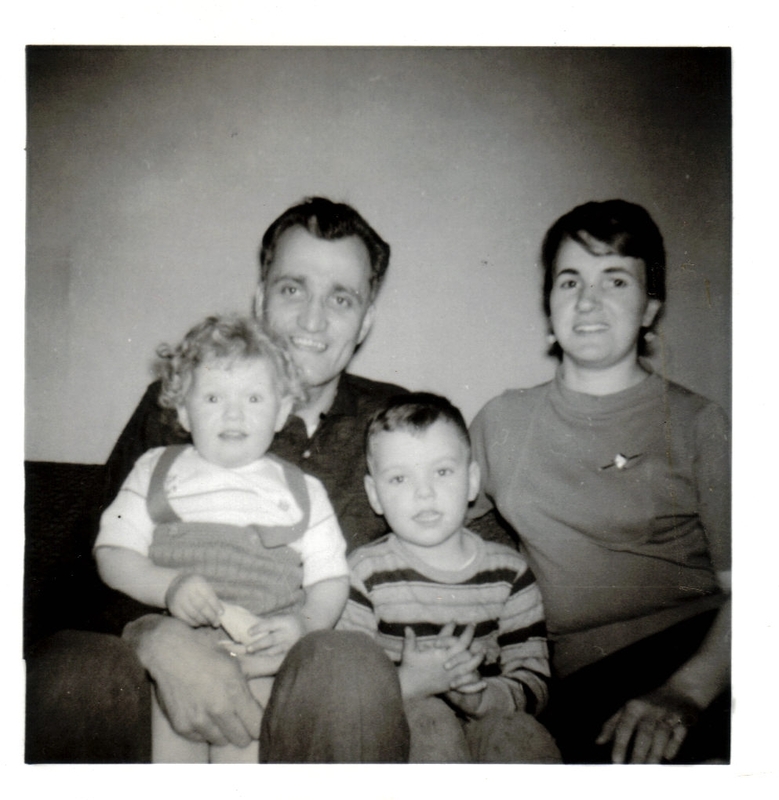 Pondering these things about my father made me think about the power of reinventing oneself. Sometimes the reinvention is necessary for survival, for instance a health issue demanding change. Other times it is a choice we make in the belief it will make us happier and more fulfilled. Number three became possible when my husband and I did what my parents had done later in their lives: made the big move out of the city and into the country. Doing so gave me new insight into why they made such a change, and the benefits of this lifestyle which happen to better suit our personalities too. in echoes from my yesterdays. In today’s age of high-definition PVR’s and the luxury of watching television on demand to fit into my schedule, I rarely watch commercials anymore, and that suits me fine. But there is one ad I have seen recently that I think I could watch every day. I won’t reveal whose advertisement it is; let’s just say it is for a financial company sharing the benefits of a home renovation loan. In this particular case, the son in the ad has just renovated part of his home to make a self-contained apartment. We see the son showing his aging father around the apartment, who appears very impressed with what his son has done. The father touches the new kitchen cabinets and remarks that the apartment should fetch good rent. Then follows his father’s reaction of surprise, and he reaches out and hugs his son. I swear, my heart gives a little leap and a flop each time I see this ad. Of course, I know why; I lost my dad nine years ago to ALS, when he was 69. I never got to see my father anywhere near as elderly, and yet healthy, as the gentleman in the ad. My mother didn’t fare much better, being diagnosed with Alzheimer’s disease in her sixties, and now in the latter stages in a nursing home. I didn’t write this post out of self-pity. I just wanted to impart to those of you who read this, the fortunate ones who still have a parent or parents who are loving, healthy and of sound mind, to treasure them. Please don’t take them for granted. You have something, and an opportunity that I will never know: the ability and the joy of giving back to those who brought you up and gave you their all. For me, watching that commercial reminds me, and lets me dream – just for a few minutes – of what could have been. On that dark, torturous day when your heart stopped beating, I could hardly breathe. I couldn’t feel. How could I myself bear to live, with this black chasm of grief where my soul used to be? You had always been my solid rock, my fortitude, and more times than it should have been, my safe harbour. And without a doubt, you were my biggest fan. You were the one who taught me that it was not only okay to be different, but it was desirable. You understood me when others couldn’t. How would I survive now? How could any of us? Somehow, though, as each day was born, we went on. I thought I was learning to live without you. The days became weeks, then months, that became swallowed up by year after passing year. Life’s problems and challenges had to be dealt with. Its promise and joys waited to be fulfilled. Often I would ask, what would you do, Dad? How would you handle this? How can I face this, or celebrate that, so you would be proud of me? And now, even after all this time, in the midst of sleep, deep inside a dream, I feel the grace of your presence, so familiar; and in the middle of an adventure when the adrenaline is racing through my being, I see your eyes mirroring my exhilaration. I even hear you joke and laugh when I take myself too seriously. Again and again you resurface, and we are face to face, sharing the moment. I feel the longed for warmth of your smile. Love truly is stronger than Death. How do I know this? Because, Dad, you have been at the core of everything that ever mattered to me. You never really left me after all.